David Foster Wallace began working on his novel Infinite Jest in 1991. Five years later it was published. And in 2005, Time magazine listed it among the 100 best English-language novels written since 1923. To this day, Wallace’s 1000 page epic, American, dystopian commentary remains as one of the most dissected books of our time, revealing its layers of complicated theme & critique one careful peeling at a time. In 2008, at the age of 46, Wallace hung himself from a rafter, leaving behind an unfinished manuscript and clouds of confusion surrounding his brilliant legacy. But amongst these key events in this man’s timeline was an interview with Rolling Stone journalist & writer David Lipsky. The pair of David’s spent five days together at the end of Wallace’s Infinite Jest book tour, an experience that profoundly affected Lipsky and prompted the penning of his own novel, Although of Course You End Up Becoming Yourself, detailing his conversations with a fascinating mind that was gone too soon. The End of the Tour is their story. After the release of Infinite Jest, David Lipsky knew that interviewing authors like David Foster Wallace was what he should be doing as a journalist for Rolling Stone magazine, not editing pieces on boy bands, but real in depth work, breaking the facades of the most interesting people in America. A writer himself, Lipsky knew the struggles of the industry, knew how hard original brilliance was to come by, and knew that a fascinating man must be behind the novel that the entire literary & academic world was talking about. And so Lipsky convinced his boss to let him work on the interview, got Wallace to agree to be interviewed, and set out on a road trip to Indiana to meet a recluse who just wrote a 1000 page masterpiece of modern fiction. But David Foster Wallace wasn’t exactly the type to enjoy meeting a new friend, to revel in the publicity that the magazine would bring his way. He was a solitary figure, someone who liked dogs more than people, who lived in the middle of nowhere, who taught at a tiny college, who thought that eating at McDonald’s was fancy. Wallace was concerned about how pretentious he would appear to the public, how his bandana & long hair would come off as affects instead of natural choices. But despite his trepidations, Wallace began an odd friendship with the man who was sent to find out his deepest secrets, even letting him stay in his guest room and share his Pepsi 6-packs. The conversations between these two talented men might be the most honest we’ve ever heard, and among the very hardest to accept. When a movie can make you immediately contact your local library and reserve a copy of the book it’s based on, you know something just went very right. And, actually, I reserved two books, Infinite Jest to lay the groundwork and Although of Course You End Up Becoming Yourself to learn more about the time shared between these two utterly interesting men. The film plays as a conversation bouncing between tall poles, with audiences in the middle soaking up the cynicism. Commentary on advertising, junk food, pop culture, the meaning of life; you don’t get much more profoundly existential while still staying grounded. And therein lies the magic; Wallace is a regular guy with unparalleled insight into the depression that we all feel to some degree. His thoughts are our thoughts, just expressed more cleverly than we could ever hope to regurgitate. Credit Jason Segel for harnessing this role and forcing it to accept him as an unworthy actor who would try his very best. And, ultimately, he did more than try, he succeeded in portraying a complicated man in a way that allowed us to be a part of this strange world of geniuses that we can only dream of understanding. Segel was vulnerable, authentic, believable; perhaps the best performance of his career. And Eisenberg wasn’t very far behind, as the star of the film in an odd way, but definitely our guide on this wacky tour of another man’s mind. Add in a few unusual cameos and you’ve got a cast that doesn’t sound like much on paper, but rises above their previous projects to impress anew: Ron Livingston, Anna Chlumsky, Joan Cusack. 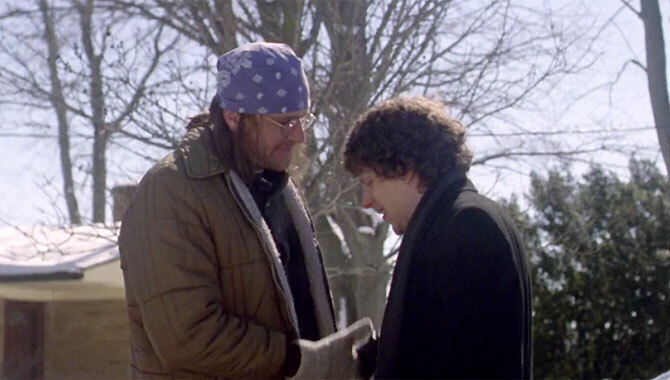 The End of the Tour is a heartfelt & philosophical tale of the everyman, but told from a true story perspective that adds special weight in a way we don’t see often enough. Video – With an aspect ratio of 2.40:1 (16×9 Widescreen), the video never lives up to its medium’s possibilities. The picture quality is always fine, always normal, but never exquisite, failing to impress in any way. Now, that said, there’s no need for a stunning visual here; the look of the movie isn’t the point. The message is delivered by the characters, not by their surroundings, which are kept cold, bleak, and colorless for the majority of the film. Audio – The disc was done in English 5.1 Dolby Digital audio, with an option for Spanish or English SDH subtitles. The sound quality was nondescript, without helping or hindering the film. There was a nice selection of 90s music to aid in the vibe of the time period, and that actually helped those of us who enjoyed that music at that time to feel connected to the era in a way the Wallace’s book might not exactly do. Extras – There are a few extras on the DVD. The film can be enjoyed with audio commentary with director James Ponsoldt, writer Donald Margulies, and actor Jason Segel. Behind The Tour is a 24-minute behind-the-scenes featurette that allows us access to the making of the film. A Conversation With Composer Danny Elfman is an 8-minute segment of the composer’s thoughts behind the simple theme he created to act as a background to the action. Six deleted scenes can be viewed, as well as five trailers: Amy, American Ultra, Mississippi Grind, Mr. Holmes, Room. Highly Recommended. 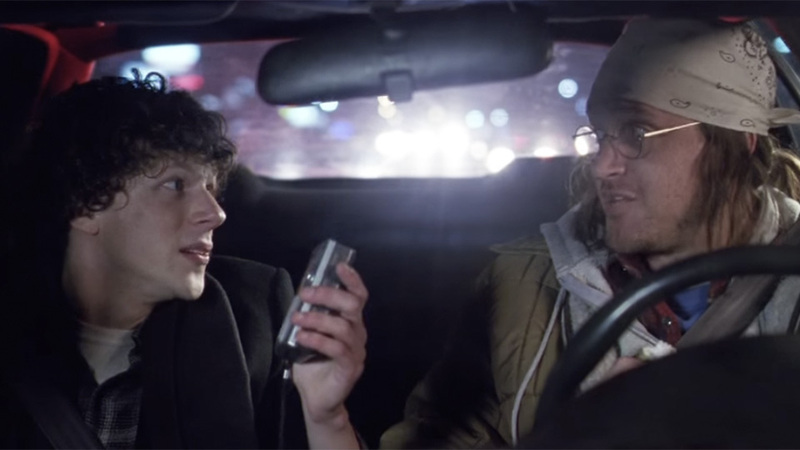 The End of the Tour is a touching film in a very weird way. It details a real life experience, paints a portrait of two men in a five-day period of their lives, and gives us a taste of a novel that might mean more than we are truly ready to accept. But the emotion of the movie comes from the budding friendship that is almost too fragile to exist on camera, something that was fleeting yet not without meaning. Eisenberg & Segel were the perfect pair for these roles, as odd as their resumes might make that seem, helping to create a film that’s at once feel-good and feel-very-bad. The video was only OK, the audio the same, and there are a few extras on the disc for those looking for a bit more. Reading the books involved might be the only way to really find more though, which is something I will be doing ASAP.